I cannot reveal my flaws in me. My ego extinguishes the merits of others, and assures me that I am perfect. But when I work with the group, I amplify our bond by 620 times, and it can accommodate inside it the entire ocean of the upper light. Besides man, there’s only the Creator. My task is to collect all the desires and combine them into one desire. 9 friends are my qualities, projected outside of me. With this form, I see my qualities prominently: insolence, thievery, disdain, and so on. The ten exists within me. I must build up this notion inside me in such a way that I could work with it as if with my own desire. After all, this desire really does belong to me, and the faces only appear to aim me correctly at the Creator. #UBI degrades people and leads to consumption, resulting in the bankers gaining power. When prices for services rise, the rich get richer. CONCLUSION: the idea of UBI is Kabbalistic, but NOT religious. UBI is only good if the population is educated, otherwise it will ruin society! I must convince myself that they are parts of my soul! “The group is not the ten, but me before myself. I must swallow them, for they are me. It’s the ego who draws their faces. I must remove the distance between us. For they are more important than me. I am Malchut, and they are my 9 Sefirot. If we have thoughts that don’t belong to unity—we exile them beyond the “wall.” Inside we clear up space from disturbances. We build the Temple—unity in bestowal and love. In it, in our common heart, the Creator is revealed to the extent we are similar to Him. By expressing love of friends, I neutralize a friend’s ego. He stops thinking of himself, feeling joy and confidence. I cancel his problems with my love. After all, when the friends are the most precious thing in my life, the Creator clothes within me and influences them. All the worst states are also from the Creator—so one will ask for help. Self-love, egoism created by the Creator, separate him from spirituality, as if there is no hope to overcome them. But it is also in one’s power to entreat the Creator and overcome the obstacles He created. Educate them to raise the spirit of unity above all differences, across all 50 states, and between all colors — especially between red and blue. 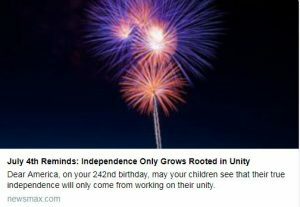 #IndependenceDay means independence from #ego, from inner evil nature. The world undergoes the waves of selfish development. It exponentially ascends and must figure out what to do with its own egoism, to define the world egoism as its primary, global, and internal enemy. We must agree with the fact that all the lowly, earthly thoughts and desires that distract us from the Creator, also come from the Creator – in order for us to accept them as coming from the Creator and respond to them with a plea for redemption. Get used to your heart always being in the desires of this world, and from inside it, you demand the Creator. Even though the desires of this world rule, you don’t retreat in your aspiration to the Creator—and you ask Him for help to overcome His very obstacles. When one feels that he is finished, unworthy, hopeless—he must remember that this state also comes from the Creator, and it’s for his own good, so he’ll turn this lower state into an upper one by changing his attitude to it.